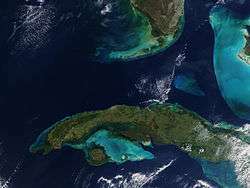 The Straits of Florida, Florida Straits, or Florida Strait is a strait located south-southeast of the North American mainland, generally accepted to be between the Gulf of Mexico and the Atlantic Ocean, and between the Florida Keys (U.S.) and Cuba. It is 150 km (93 mi) wide at the narrowest point between Key West and the Cuban shore, and has been sounded to a depth of 6,000 feet. The strait carries the Florida Current, the beginning of the Gulf Stream, from the Gulf of Mexico. In 2004 the Spanish oil company Repsol-YPF drilled in deep Cuban waters between Cuba and the Florida Keys, and found an oil deposit; the deposit was judged noncommercial, and the hole was plugged. In October 2008, Cuba signed an agreement with the Brazilian state oil company Petrobras, which provides for Petrobras to drill for oil and gas in deep waters off the north shore of Cuba. In July 2009, Cuba signed an agreement with the Russian government giving the Russian oil company Zarubezhneft oil exploration rights off the north shore of Cuba. By May 2011 Petrobas had withdrawn from the 2008 agreement due to poor prospects. In 2009 the Falkland Islands-registered company BPC Limited and Norwegian company Statoil announced a joint venture to drill for oil in Bahamian waters north of Cuba and southeast of Florida. The government of the Bahamas has indicated that applications for offshore drilling are on hold pending negotiations with Cuba, the United States, and the Turks and Caicos Islands on the exact boundaries between their respective Exclusive Economic Zones. ↑ United Nations, Maritime boundary - modus vivendi effected by exchange of letters between the United States of America and the Republic of Cuba, 27 April 1977, PDF file. ↑ University of Texas, Jorge R Pinon Cervera: Cuba's energy challenge: a second look, PDF file, retrieved 3 March 2009. ↑ Assessment of Undiscovered Oil and Gas Resources of the North Cuba Basin, Cuba, 2004, (2005) US Geological Survey, Fact Sheet. ↑ George Will (5 June 2008): The gas price we deserve, accessed 13 March 2009. ↑ Reuters (16 April 2008): Cuban off-shore drilling put off until 2009, accessed 11 March 2009. ↑ Time (23 October 2008): How Cuba's oil could change the US embargo Retrieved 17 December 2008. ↑ "Petrobras signs with Cuba", World Oil, December 2008, p.109. ↑ BBC News, Russia to drill for oil off Cuba, 29 July 2009. ↑ "Petrobas abandons oil exploration in Cuba". MercoPress. Retrieved 22 March 2014. ↑ Reuters (18 May 2009): BPC Limited and StatoilHydro to reopen Bahamian energy exploration with offshore..., accessed 28 May 2009. ↑ BPC website, Overview of assets, accessed 15 July 2009.